Awarded for service during the Anglo-Boer War of 1899-1902. 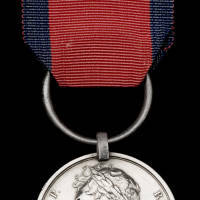 9L and 12L fought in a number of engagements and soldiers could have been awarded clasps for actions in the provinces of Cape Colony, Natal, the Orange Free State and Transvaal, as well as the battles of Belmont, Modder River, Relief of Kimberley, Paardeberg, Driefontein, Johannesburg, Diamond Hill, Wittebergen and Belfast. Soldiers in both Regiments could in certain circumstances have been awarded the clasps, South Africa 1901 and South Africa 1902.